In weaving, the shed is the separation between the two layers of warp yarn to facilitate weft insertion. The process of raising and lowering of the upper and lower warp threads for interlacing of weft threads is shedding. A heald (also called heddle) is a looped wire or cord suspended from the shaft of a loom. It has an eye in the centre through which a warp yarn is passed in a loom before going through the reed to control its motion and to separate the threads for weft insertion. There are as many healds as there are threads. A set of healds support a structure called as heald frame. · It is a shedding mechanism placed on the top of the loom to create patterns by using larger number of healds as compared to a tappet. · It is compact and electronically guided. Designs are more complex than a tappet but production of tappet is greater. · Theoretically it can control up to 48 heald frames, but in practice it uses 36 for woollen fibres and 24 for fibres like cotton. · Dobby looms usually provide geometric design or patterns. Second-hand Rapier looms and Airjet looms with Dobbies can be purchased at Vendaxo. · The tappet works on the principle of rotary motion to produce reciprocating motion in the followers and levers. The heald frame is operated by this rotary motion. The followers are called anti-friction bowls while the levers are formally known as the treadle arrangement. · The nature of the movement is such that the number of heald frames is limited to 8. Any design requiring more than 8 heald frames needs a dobby loom. · Due to its simple and limited shedding mechanism, the design is restricted to plain designs. The Jacquard machine is a device fitted to a power loom that can be used to produce elaborate designs and patterns that cannot be easily accomplished by dobby and tappet systems. · A jacquard shedding loom provides unlimited design options because each warp yarn can be individually controlled. · It has no heald frames, instead, a harness comprising of as many wires as there are ends in the warp sheet connects each end individually to the loom. The harness is used to lift and lower the warp thread. · The loom can control up to 2000 ends per repeat/cycle. · The only limit to the number of repeats is the cost and inconvenience of producing a very complicated pattern chain. · Two or more jacquard machines can work in conjunction if more independent lifts are required. · It can be operated electrically but also manually by skilled workers. · Any kind of design is possible using a jacquard machine. The weave produce is very intricate. · It has a wide variety of customisations possible to suit the need of the owner. · It can be used to weave specialised fabric such as terry towels, carpets and damask. · Cost of installation runs high because of the complex machinery. · They need to be operated very carefully because they are prone to producing errors. · The fabric produced is more expensive than dobby or tappet. · Production is not as much as simple mechanism of the tappet. 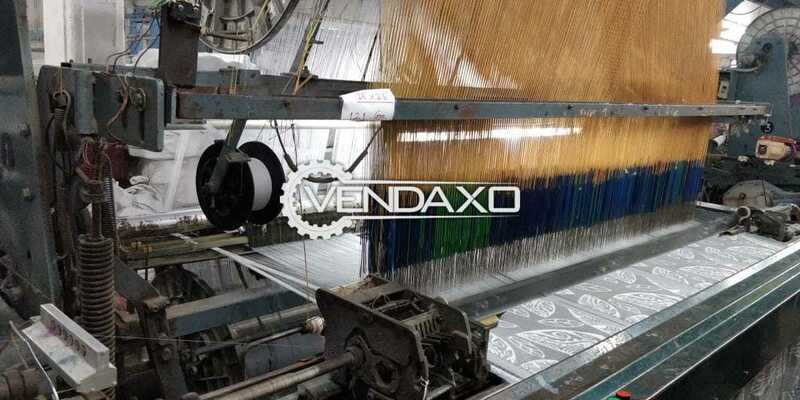 Check out high quality second-hand Jacquard looms here at Vendaxo.